A good question to ask, always, before purchasing any kind of art to hang on your wall, is: Do I have the wall space? 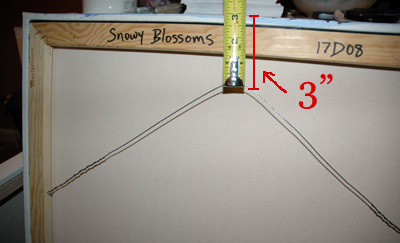 If you’re like me, very familiar with certain measurements because you see them all the time, like 16″ x 20″, 24″ x 36″, etc. then you might be able to tell at a glance whether or not there’s room on your blank wall to hang a painting. But chances are most people will need to measure to make sure. Aside from just measuring the wall with a measuring tape, I would also recommend taking it one step further to really get an idea of what a painting of a certain size would look like in that spot. Take a large sheet of scrap cardboard, poster board, or anything you can get your hands on that’s large enough. It can be destined for the trash—doesn’t matter. You may have to take several sheets of paper and tape them together. Just figure out a way to create a rectangle the exact size of the painting. You can then hold this up on the wall and really visualize what it’ll be like. The painting should not take up all of the available space, if you can help it. It is good to have a certain amount of what I call “buffer” around the painting to give a place for the eye to rest. At the same time, you also want the artwork to make a statement. 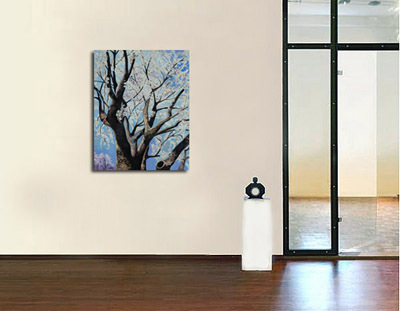 If you hang a small painting on a large wall, it may not have the kind of visual impact you’re looking for. Here’s what happens when the painting is too small for the wall. 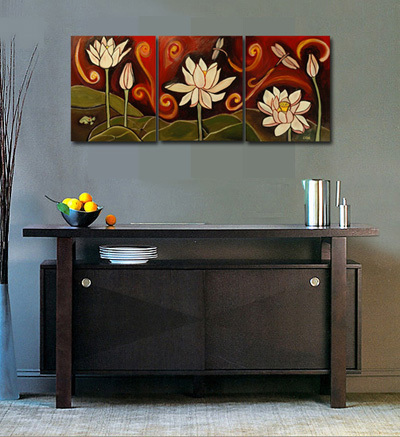 So when you’re decorating, try to choose artwork for your space that is not too big, not too small, but just right. Once you’ve selected your new artwork, determined where it will go, and finally got it home, hanging it on the wall is a simple, if specific, process. You will need a picture hanging hook, a pencil, a measuring tape, a hammer and a level. The first thing you need to do is find the point on your wall where you want the center of the painting to be. You may need to measure if you want it exactly centered on a wall, but in most cases it is okay to eyeball it. Mark the spot with a piece of masking tape or a small pencil mark. 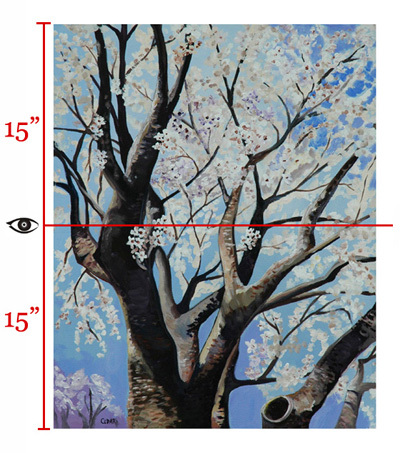 Then measure the length of the painting (from top to bottom) and find the midpoint by dividing that number in half. 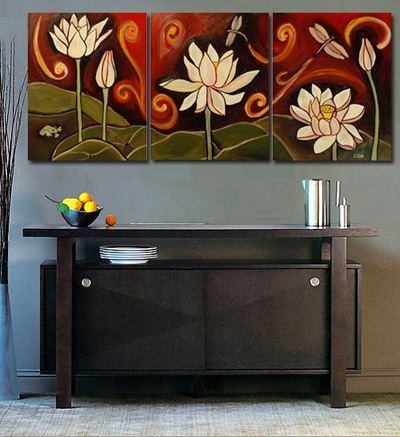 Say your painting is 30″ high x 24″ wide. The vertical midpoint would be 15″ from both the top and bottom edges. You want this imaginary line to be at eye level when the painting is hung on the wall. The average person’s eye level is at about 60″ from the floor. If you are taller or shorter than average, you can use a measuring tape to figure out where your eye level is. Let’s assume in this case that it’s 60″. You want to pull the wire up towards the center of the painting’s top edge, just as if it were hanging on the wall and gravity were pulling it taut. Measure the distance from the wire to the top edge of the painting. The number you need is the measurement from the “eye level” line, or vertical midpoint, to the point where the wire will hang on the hook. To get this number, subtract 3″ from 15″, to get 12″. This is how high above eye level you will need to place the bottom of the hook. So add 12″ to your eye level measurement of 60″. 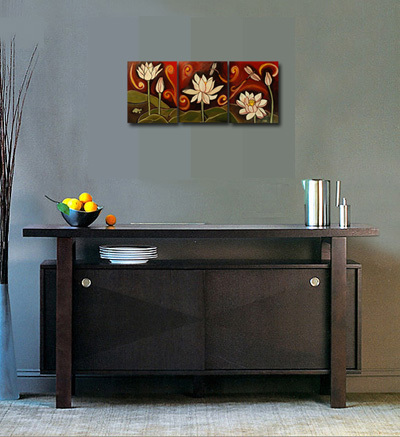 You will place the bottom of the hook for this painting at 72″ from the floor. Mark this spot with a pencil dot. 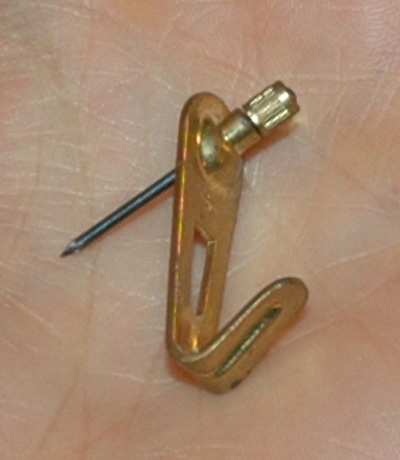 Picture hanging hooks can be purchased at any hardware store. The ones I use look like this. The nail goes in at an angle to really anchor it into the wall. 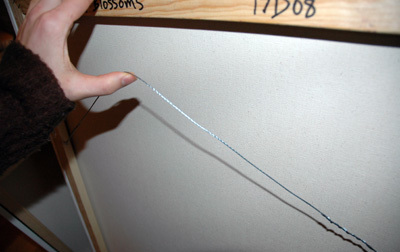 If you are hanging a heavy piece of art, make sure to use hooks that are rated for the proper weight. I don’t recommend using nails because the wire can slip off of a nail. With a hook there is no chance of that. 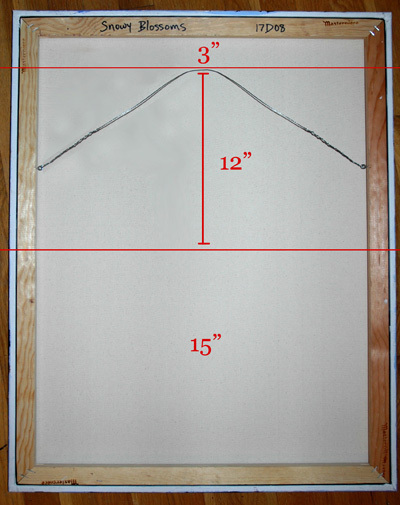 If you’ve measured correctly, when you hang the painting by its wire on the hook, the center of the painting should be exactly at eye level. (If you’re off by a half inch, don’t stress about it–you won’t be able to tell by looking.) Use a level to make sure it’s hung straight. Note: If a painting is much wider than it is high, for example, 24″ high x 48″ wide, the canvas will usually have a cross-brace in the middle. In these cases you will have to hang the painting from 2 hooks, one on either side of the cross-brace. When pulling the wire taut to measure its distance from the top edge, you’ll just have to pull it taut across 2 points. It’s a little tricky but if you understand the theory, you’ll be able to get an accurate measurement. The important thing in those cases is to use a level when installing the 2 hooks to ensure that they are placed in line with each other. Of course a painting does not always have to be at eye level—for example, if you are hanging it above a piece of furniture or in a configuration with other paintings, eye level becomes less important. In those cases it is usually best to eyeball it. But once you figure out where you want the center of the painting, you can still use this method to figure out exactly where the hook should go. Hopefully this info will be helpful to you next time you’re hanging a painting, photograph, or mirror.